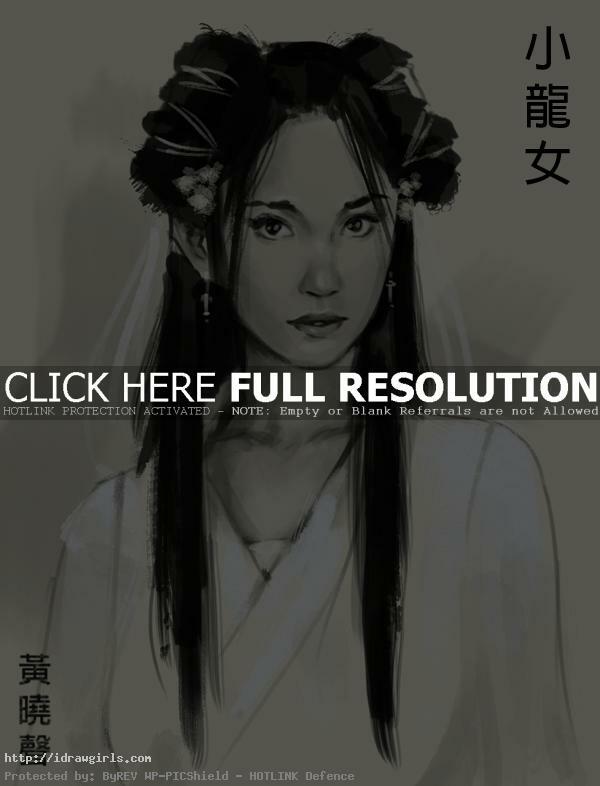 How to draw Xiaolongnu 小龍女 from Return of the Condor Heroes 神鵰俠侶, a wuxia novel. Learn to draw Xiaolongnu 小龍女 in a simple portrait illustration style from step by step with instruction. 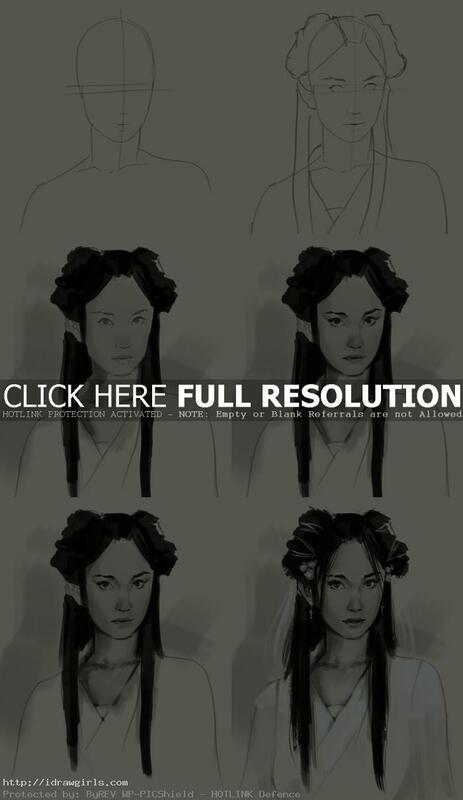 In this tutorial, you will learn to draw Xiaolongnu 小龍女 that resemble to an actress Fann Wong 范雯芳. You will learn to draw facial structure or portrait along with her with long traditional costume trademark. Xiaolongnu is a main character from Return of the Condor Heroes, a novel, by Jin Yong 金庸 (Dr. Louis Cha) and the second part of the Condor Trilogy. She is a symbol of pure and cultural contradiction characters in my point of view. This drawing took me about twenty to twenty-five minutes for the demo tutorial purpose. It is not a finished illustration by any means. First, I draw a simple egg shapes to established base for the facial structure. It is an easy way to achieve accurate proportion and likeness of the character is to make simple shapes first. Once we established the solid construction in the base sketch, then we can refine our line work on top of the foundation . It is important to get correct shape, proportion, and placement in the initial sketch first. First rule of portrait drawing it to observe the subject’s face carefully, then keep portrait simple and keep the foundation accurate. Return of the Condor Heroes 神鵰俠侶, a Wuxia novel, is a Chinese style fantasy novel. In my opinion, they are very similar to the Western fantasy novel like “Lord of the Ring” and “Game of Thrones”, except that they emphasis on super natural power by cultivating Kung Fu and Chi instead of magic. Xiaolongnü is the fictional female protagonist of Jin Yong’s wuxia novel The Return of the Condor Heroes. The author describes her physical appearances as “skin as white as snow, beautiful and elegant beyond convention and cannot be underestimated, but appears cold and indifferent” (全身雪白，面容秀美絕俗，清麗秀雅，莫可逼視，神色間卻是冰冷淡漠). Xiaolongnü’s name (literally “Little Dragon Maiden”) is based on the year she was born, the Year of the Dragon. Her real name is unknown and is never mentioned. Xiaolongnü was raised as a disciple of the Ancient Tomb Sect by the student of the sect’s founder Lin Chaoying. As a child, she was taught all the sect’s martial arts and mastered all of them after many years. She starts learning the sect’s highest order skill from the Jade Maiden Heart Sutra, but since her teacher’s understanding of the skill was incomplete, her own understanding is even more limited. Below are step by step how to draw Xiaolongnu 小龍女. Step one, I start with an egg shape drawing, this portrait will be in front view of a face. Imagine a flat plane on front surface of an oval shape, then draw two vertical lines across the imaginary plane. After that, draw a vertical line to divide the flat plane in half from top to bottom. Then draw a horizontal line to separate the top and bottom distance in half. This horizontal line would be where humans eyes should be, they are usually right in the middle of the face horizontally. Step two, I drew her eyes on the level of horizontal lines, nose half way from eyes level to the bottom of his chin, lips half way from the tip of his nose to his chin. Then I added some hair. Step three, I fill his face and body with half tone value then begin to add detail to his eyes then eyebrows, and nose.